From a young age, our kids were well aware they could die from exposure to peanut if they weren’t careful. Many a time, they were star advocates for their own safety, turning down offers of peanut-containing treats, asking about ingredients in foods served to them, and making sure they had their life-saving medications with them at all times. Despite our best efforts to keep Soren and Tessa safe, our kids have had numerous anaphylactic reactions to peanut between them over the years. At age five, Soren cried out to me for help just minutes after I tucked him into bed. When I got to his room, I saw that he was having so much trouble breathing, his upper lip was blue. Thinking at first he was having an asthma attack, I gave him his inhaler. Then his lips swelled like a special effect in a movie. In a panic, I gave him a dose of antihistamine before injecting him with epinephrine – following his emergency protocol backwards even though I should have known to inject him first. The instant I picked up the phone to dial 911 that unforgettable evening with Soren, my husband, Andy, was miraculously on the line calling me from a nearby store. I told Andy that Soren was having anaphylaxis and I had to hang up so I could call for an ambulance. Amazingly, Andy beat the paramedics to our house and was able to ride with Soren to the hospital for observation while I stayed to arrange care for Tessa, who was sleeping at the time. A couple of months later, Soren had another anaphylactic reaction at school, followed by a second, “biphasic,” reaction about 20 minutes later in the ambulance en route to the emergency room. These were Soren’s only anaphylactic episodes in his first 12 years of life. While we don’t know for sure where Soren’s exposures came from, we can only assume peanut was the trigger, given the severity of his reactions. By age 10, Tessa had so many anaphylactic episodes inside and outside of school settings, she’s was an old pro. Before undergoing peanut OIT, visits with the school nurse, as well as the paramedics, had practically become routine for her. Tessa’s reactions typically started with tingling in her ears, followed by wheezing, sneezing, upper-body flushing and feelings of impending doom. Then she’d get an uncontrollably runny nose and full-body hives. Fortunately, Tessa’s emergency medicines, including epinephrine, antihistamine and her asthma inhaler, alleviated her anaphylaxis, and her reactions didn’t escalate to closing of the airways, cardiac arrest or death. We’re grateful that most people in our lives have been supportive in helping keep Soren and Tessa safe. A few, however, had expressed resentment toward us for requiring peanut-allergy accommodations. Rather than get too upset about this behavior, I compare learning about peanut allergies to learning about death. The news can make people – myself included – undergo the five stages of grief. 2. Next, anger. Accommodating kids with peanut allergies is a pain! 4. Fourth, grief, either in the form of feeling sorry for peanut-allergic children, sorry for oneself for having to deal with peanut allergies, or both. Understandably, friends were reluctant to invite Soren and Tessa to their homes for playdates and birthday parties. Some feared inadvertently exposing Soren and Tessa to peanuts, causing anaphylactic reactions and having to administer shots of epinephrine. Similarly, my husband and I were reluctant to let our kids go to new places. Why risk it? Yet, as our kids grew older, we were starting to feel isolated from our community – as though our kids had the plague. It was no way to live. 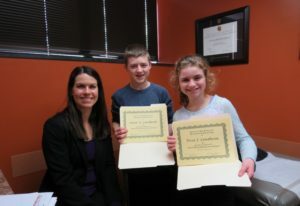 Fortunately, peanut OIT was showing promise as a peanut-allergy treatment for Soren and Tessa. But it was only being performed in clinical-trial settings at first. Given our kids’ history of asthma, as well as prior anaphylactic reactions to peanut, they didn’t qualify for the trials. Outside of trial settings, peanut OIT was only available from doctors in faraway states. I gave up hope of receiving local peanut OIT for my kids anytime soon and decided to move with Soren and Tessa to Dallas, Texas for peanut OIT from Dr. Richard Wasserman or to West Hartford, Connecticut for peanut OIT from Dr. Jeffrey Factor at New England Food Allergy Treatment Center. It was then that I learned about Dr. Whitney Molis – an allergist administering peanut OIT in Des Moines, Iowa — just a 4.5-hour drive away from our home. I hadn’t heard of her before, because she doesn’t include peanut OIT as a service on her website. She doesn’t need to; patients are lining up to receive peanut OIT from Dr. Molis based solely on word of mouth and a few online news stories about her treatment. Under Dr. Molis’ expert care, Soren and Tessa started peanut OIT with a dose of 1/250,000th of a peanut on July 9, 2013. During weekly peanut-updose visits over the course of nearly six months, they worked their way up to the final dose of 21 peanuts, which they consumed under observation in Dr. Molis’ office on January 3, 2014 – their peanut OIT graduation day. Despite the long drive, we looked forward to every peanut updose appointment in Dr. Molis’ office. Each made Soren and Tessa less vulnerable to peanut, and surprisingly, all visits were covered by our medical insurance. Peanut OIT didn’t go without incident. Our kids experienced mild symptoms on occasion, such as tingling in their throats or hives shortly after taking their doses. Tessa had a few more involved reactions during treatment as well, triggered by heightened activity during the two-hour, post-dose downtime phase — a phase patients must strictly observe. Dr. Molis closely monitored our kids throughout treatment, downdosing them on such occasions and during illnesses. 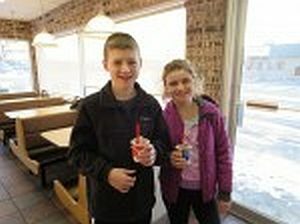 After graduating from peanut oral immunotherapy (OIT), Soren and Tessa enjoyed their first DQ Blizzard Treats. Now that Soren and Tessa have completed peanut OIT, they must consume their doctor-prescribed doses of peanut everyday to maintain peanut desensitization, indefinitely. They’re also encouraged to consume peanut-containing foods throughout the day. Soren doesn’t mind the taste of peanut, so he’s been regularly exceeding his minimum peanut dose. Tessa still dislikes peanuts, no matter how much I try to disguise the flavor in candied peanuts, ice cream, brownies or other concoctions. Hopefully she’ll come around! Either way, our commitment to completing Dr. Molis’ peanut OIT program has been worth every peanut dose and every mile of the commute. Post peanut-OIT, friends can now invite Soren and Tessa to their homes without worry of exposing them to peanut. They can go on field trips without specially trained chaperones, or me, at their side. At restaurants, cafeterias and ice cream parlors, Soren and Tessa can now choose any item on the menu — whether or not it was made on equipment or in a facility that processes peanuts. They can eat DQ Blizzard Treats, peanut-containing candies and assorted chocolates, just like other non-peanut-allergic kids. It’s so freeing!